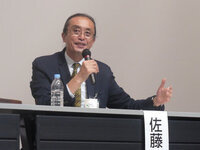 The lecture by Professor Tets Sato (an environmental biologist and Deputy Director General at the Research Institute for Humanity and Nature in Kyoto, Japan), will introduce the concepts of sato-yama (literally “village-mountain”) and sato-umi (literally “village-ocean”) which represent traditional Japanese land-use systems based on a balanced relationship between human beings and nature. On June 27, 2007, the Japanese government announced the Satoyama Initiative in order to re-examine how human beings can become partners in sustaining a variety of ecosystem services. The Satoyama Initiative seeks to remember traditional ways in which people worked with mountains and oceans and to explore shared management systems in which various actors, including corporations, participate in working toward the combined goals of a low-carbon, resource circulating, nature-harmonious society. In addition to his work in Japan, Professor Sato has visited the Walla Walla and Columbia River basins to study on-going land management and salmon-safe initiatives. His talk coincides with a Whitman College class on Haiku and Nature in Japan.